Recently, I have become very interested in the Roboriders line of LEGO models. 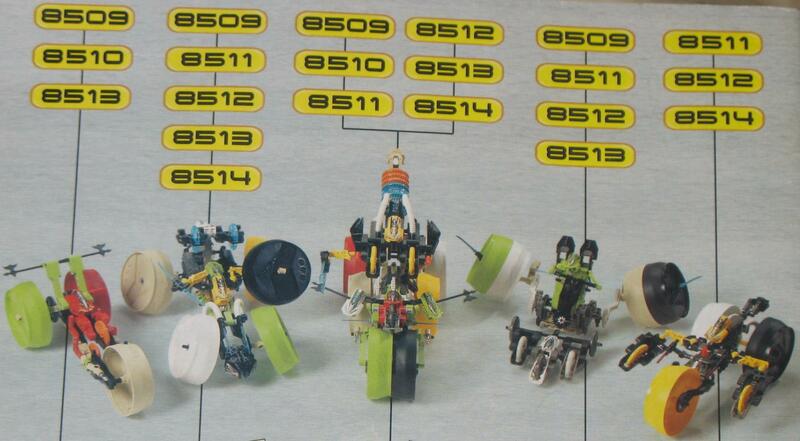 I've completed my collection, but there is still something I can not find: I have been looking for instructions of the combo roboriders, as shown here. These instructions were only ever available on the long-gone roboriders website. My quest for these instructions has taken me all over, and I've messaged many people in my search, including LEGO's help center. Not even the team who produces the building instructions has a copy. My most recent efforts have lead me to this forum, and I am wondering if anybody here might have the instructions saved somewhere? I checked a recent topic on the subject but it appears to be long dead. If anybody can help me, please send me a message. Ooh, a tricky challenge! Let me see what's on the archive.org Wayback Machine. That is sometimes reliable and sometimes not. I couldn't find PDFs of the building instructions on Brickshelf either, but I did find a lead: Brickshelf user Sparkytron has pictures that seem to be from the building instructions. I am well-acquainted with Sparkytron on Flickr so I sent him a message asking if he has copies of the building instructions he can upload. I'll get back to you when he responds. I should probably mention, though, those pictures are from different combo instructions, from the instruction manuals that come with roboriders. These instructions show how to combine Swamp and Lava, Onyx and Power, and Dust and Frost. Yeah, you're right. I can't believe I made that mistake. It turns out that he didn't have the instructions you were looking for, so I suppose I haven't really managed to be any help. Sorry about that! It's perfectly okay, I still appreciate that you tried to help! I've been looking for these for years! I think I created a post on these forums a few years back, to no avail. Would be cool to find them. But I must try just to build them from the picture on the back, can't remember how detailed the picture was, but I guess it'd be worth a shot! Here are the RoboRiders combiner instructions. Enjoy!! Well, you have just made my whole week. Have been literally looking for these for the last 15 years. This is a good excuse to dig my roboriders out of the cupboard. Thanks so much. Just out of interest, @Cryonic2099, did you just have these lying around on your hard-drive, or did you track them down somewhere online? I've had them since they were on LEGO's website forever ago. I love it when this community comes together and solves problems like this! This is quite amazing :) Great job Cryonic, I bet you have some other old stuff from the LEGO website (and others) that the internet archives would be more than glad to have;) Really, you should donate some of this stuff to them. I don't think I have anything else from LEGO, but I'd be happy to donate anything I find. Only problem is, I don't know how to go about that.